Earlier this week I posted Everything You Need to Know About the Hammond/Oregon/Militia Situation. (Un)fortunately, I no longer watch Cable News so I don't know what their reactions are (not that it really matters) but I came to the conclusion that every person on the West Coast and especially Alaska, should be paying very special attention to this--because a very similar event may happen in our neighborhood in the future. Nearly 70% of the State of Alaska is owned by the Federal Government, unfortunately because of the concessions made in the Alaska Statehood Act, the State of Alaska 'legally' cannot try to cede Federal Government Land, but that doesn't mean that we won't try. The 2013 Federal Government Shut down is estimated to have cost the state $39 million and while it may seem like chum change for the Feds. For Alaska, it meant hindering the crabbing and fishing industry as well as lost tourism money due to shutting down state and federal parks [source]. In fact, so indignant was the State of Wisconsin over these closures that Governor Scott Walker refused to shut down some of the parks and our own former Governor Parnell threatened to sue the federal government over the forced closures. If the shutdown lasted much longer, it could be probable that the Alaskan Government would have followed Wisconsin's example and re-opened the parks themselves. It is an open secret that the main reason Uncle Ted and Crazy Uncle Don Young were/are so popular among Alaskans is because of that sweet sweet pork barrel spending that they bring into the state. 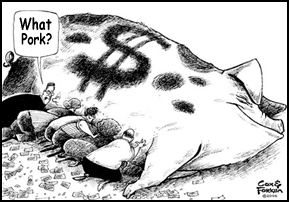 Alaska has been hovering around the $10 Billion dollar mark in Federal spending for the last several years and according to Citizens Against Government Waste, Alaska has routinely ranked 1st in per capita 'pork' spending [source]. If and when federal monies starts drying up, which lets face it, with $18 trillion in debt the Federal gravy train will end soon and Alaska will become desperate for funding. Since Alaska is a resource dependent state, who would stop Alaska from taking over a portion of 'federal' land and extracting it's resources (read: ANWR)? Alaska is going through a financial budget crisis with the upcoming budget deficit at $3.5 Billion. This is in large part due to the collapse of the price per barrel of oil--the revenue of which makes up 90% of Alaska's budget. The US Economy still has a record 94 million people not in the labor force, $18 trillion in debt, and despite the optimism of the 2015 economy, experts are predicting that the US will again go into another recession this year. Now, if you add one more curve ball in the form of state debt and unfunded liabilities, you can begin to imagine that if the US did fall into another recession or had another government shutdown. States would be in serious trouble and looking for any tangible way to make money. 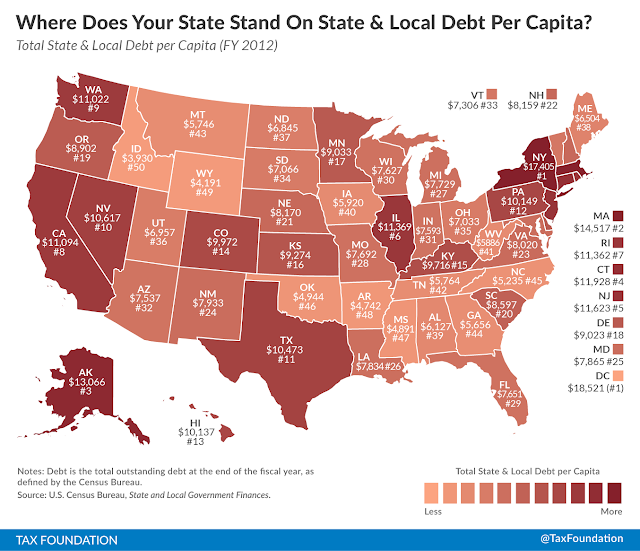 Despite ranking #3 in this chart, Alaska is one of the few states to have AAA bond rating in the process of writing this article AK was downgraded to AA+. 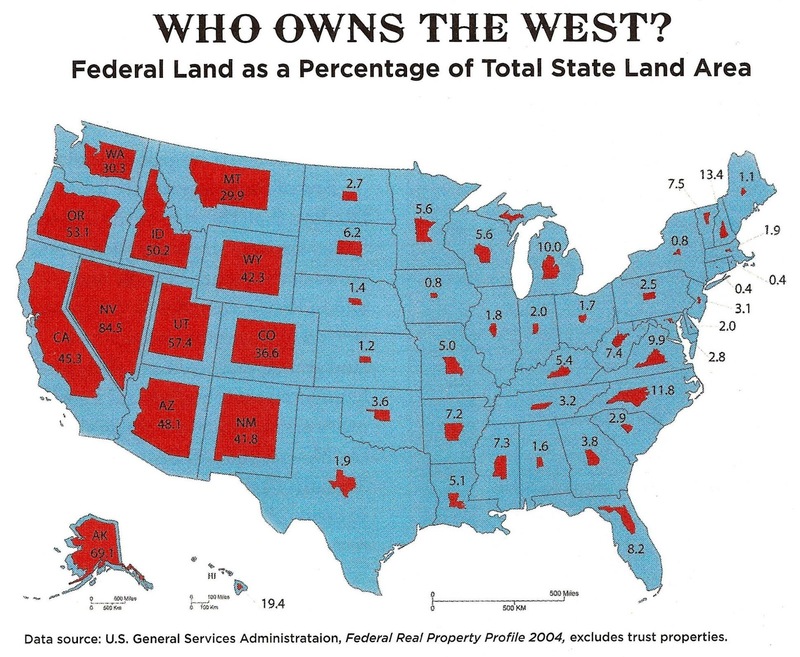 Yes, Governor Walker is debating about creating and/or raising taxes but I can guarantee you, every single year, State Legislators dreamily imagine all the revenue they could raise if they had access to the entire state land and if given a choice between raising taxes or taking over Federal Land, Alaskans would prefer the later. Granted, this is all pure speculation and you, dear reader, may scoff at my analysis and say to yourself, 'this would never happen.' However, I am keenly aware and cautious of that phrase, "this would never happen." The same thing was once said about the Soviet Union, "the Soviet Union will never collapse." Having been born in the Soviet Union, I can tell you that yes. The impossible does happen. Don't be surprised if outright rebellious tensions between State Governments and the Federal Government arise.